“The prohibition applies to Sailors, Marines, Military Sealift Command civilians and any personnel working on or visiting those units,” according to a statement obtained by NPR’s Sarah McCammon, issued by the commanders of the U.S. Fleet Forces and the U.S. Pacific Fleet. “The Fleet commanders implemented this policy to protect the safety and welfare of Sailors and to protect the ships, submarines, aircraft and equipment,” it adds. 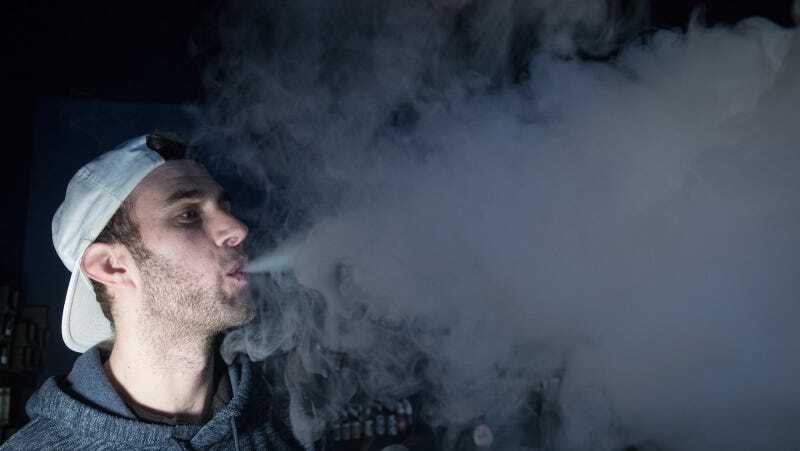 The danger of vaping isn’t that you might look so cool doing it that the captain gets distracted by a cloud of sweet smelling smoke and plows right into an iceberg. It’s the lithium-ion batteries, which have an earned reputation for exploding. This could present a serious danger on, for example, a submarine. There have been exploding issues in 15 instances involving navy personnel between October 2015 and January 2016, according to a Navy memorandum, two of those calling for the need to break out firefighting equipment. Maybe two fires a year seems like a small price to pay to live the vape life, but officials disagree. The ban is theoretically temporary, but will “remain in effect until a final determination can be made following a thorough analysis.” Meanwhile, if you’re in the Navy now you can still smoke tobacco cigarettes in designated areas, if you want to take that kind of risk.